100% cacao. The chef's choice. Gluten and nut free. Suitable for vegetarians. Kosher.Cacao has been consumed for its superfood healthy properties for generations in Latin American cultures. 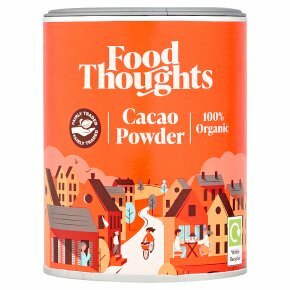 Food Thoughts Cacao Powder is non alkalized and prepared naturally to ensure it retains health giving nutrients. A natural source of flavanols and antioxidants, fibre & protein. The intense chocolate flavour makes Food Thoughts Cacao Powder an ideal healthier baking alternative for cakes, cookies, brownies. Also delicious in smoothies, hot chocolate drinks or sprinkled on your breakfast.